With its charming architecture, traditional souqs, picturesque Abra rides and quaint little stone pathways Madinat Jumeirah is an authentic recreation of a by-gone era of Arabia. A 2km strip of private beach dotted with 5-star dining, boutique hotels, summerhouses, and extensive fitness centres present a stark contrast to the old-fashioned ideal. Yet somehow it all goes together, the old and the new, the boutique hotels and the traditional souks all come together to paint a compelling picture. It will tempt the traveler in you to visit this place. 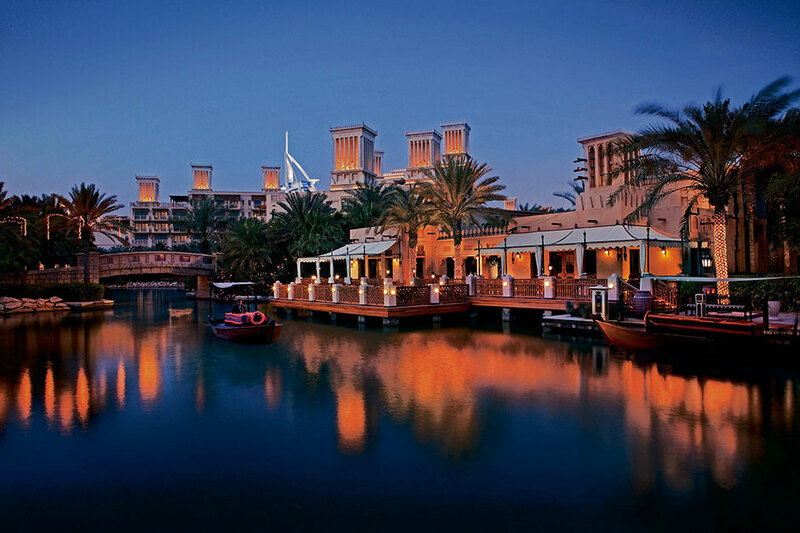 Set sail along Madinat Jumeirah’s stunning waterways, in a traditional Arabian style wooden boat: Abra. The Abra tour will treat your eyes to lush greenery, maybe a turtle or two if you are lucky, all against the backdrop of the Burj al Arab. Abras can also be used for navigating the Madinat Jumeirah waterways and connects you to the hotels, the souk and the different restaurants and cafes littered around. You can also indulge in ‘High Tea n High Tide’ where you will be served bubbles, sandwiches, English scones and delicious designer cakes. Colourful traditional antique pieces like lampshades and hookahs line the walls of the 90+ boutiques situated throughout the souq. Designers such as Lulu Guinness and Vilebrequin also sell their items here alongside fresh produce and goods, which spill onto the streets in little wooden barrows. We recommend visiting this place around twilight to truly appreciate the dramatic lighting and the romantic ambience. The souq boasts many cafes and restaurants serving coffees and seven course meals. With over 20 excellent dining options to choose from, Madinat Jumeirah is a sea of possibilities; be it cafes, bars, lounges or gourmet restaurants. From Thai cuisine to Belgian chips and from Indian curry to Arabic mezze, let your culinary senses run wild. If you are willing to shell out some extra cash for a romantic dinner for two by the Al Qasr beach, they offer a four-course meal for Dh3000, which includes foie gras and lobster, meat and fish as well as mouthwatering desserts. Ladies are welcomed with flowers and there are majlises to sit and relax after dinner. Click here for a list of eateries in Madinat Jumeirah. Madinat Jumeirah boasts two impressive boutique hotels: Al Qasr and Mina A’ Salam and a courtyard of summerhouses called Dar Al Masyaf. The Dar Al Masyaf consists of the Malakiya Villas, which has its own private courtyards, terraces and pools. For an exclusive Arabian feel, you can sign up for the Gulf Summer House Ocean suite or the Arabian Summer House Arabian Suite. Both the boutique hotels have their own signature restaurants providing breakfast, lunch and dinner. Featuring 26 treatment rooms, inclusive of two couples' suites, the Talise Spa at Madinat Jumeirah is capable of awakening your mind, body, and soul. The spa also features a communal swimming pool. Other facilities include your own private yoga studio, sauna and steam rooms, relaxation areas and cabanas for massage at the beach. Along with this, there are five tennis courts, squash courts, aerobics and a well-stocked gym. For faster results, you can check into their high altitude suites, which creates hypoxic atmospheres without changing the air pressure. This increases the fat burning time, resulting in overall good health and fitness. Situated to the far end of the Madinat Jumeirah, is another of Dubai’s little gems: the ultimate water park, Wild Wadi. Accommodating 30 exciting rides, it is themed around a character from the Arabian folklore. For the adventurer in you try out their two new rides: Tantrum Alley and Burj Surj. Wild Wadi can be accessed for free by guests of Madinat Jumeirah’s hotels. The largest luxury beachfront in the UAE boasts elegant examples of architecture which old Arabia is known for. Madinat Jumeirah encompasses the rich heritage and traditions of Arabic culture, allowing visitors to experience the history and roots of Arabia, all with a modern twist. This is evident from the long winding paths and wood carved archways, decorated with lampposts, which cast a soft yellow shade, and with lush landscaped gardens. Enjoy the detailing of the structures with bear influence from Oman and other Arabian countries. Doors and other fixtures have been reproduced from those at Dubai Museum and the Mastikiya area of Dubai, making it unique. The Madinat theatre is situated inside the Souq Madinat and can accommodate large-scale shows. Despite its size, the theatre still brims with an intimacy that allows the audience to connect with the production and performers. The theatre regularly hosts musicals, plays, classical ballets and stand up comedies. A non-profit organization, the Dubai Turtle Rehabilitation Project aims to help sea turtles that are found sick or injured and sometimes washed up on the beaches of Dubai. Since 2004, more than 560 turtles have been rehabilitated and released back into the water. They are tagged with tiny micro-chips that help track them for daily updates as to where they are heading. Along with this, they run weekly educational programs and turtle feeding, ideal for children.